Half Moon runs a ‘Play in a Week’ project as a holiday drama activity for young people with disabilities. In the summer of 2018 we ran a week-long drama and music summer school, Performance Works, for young people with physical, sensory and/or cognitive disabilities, creating a collaborative piece of theatre in just five days. Performance Works was funded through the generous support of the Merchant Taylors’ Company Charity. Throughout the week, the participants discovered their gaming hero avatars. Looking at old games for inspiration and working with a musician and a set designer, they created games, music, a soundtrack, and weaponry. Are you ready to play the game? Hover over the image below to click through the photo gallery. Previously, Half Moon worked in partnership with Futureversity to run the programme in Tower Hamlets for 12 years until the summer of 2012. 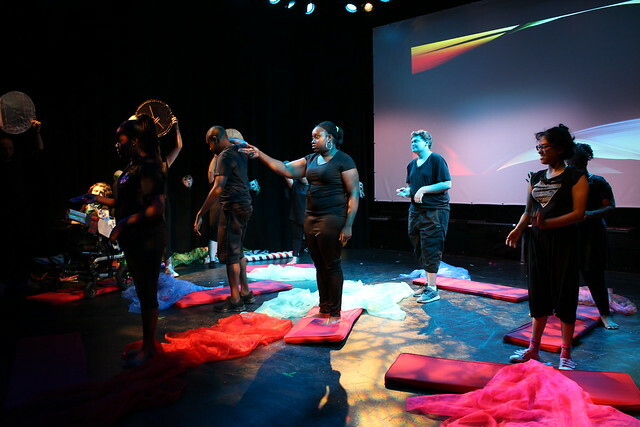 The project was specifically designed for neurodiverse young people and young people with physical, sensory and/or cognitive disabilities, offering them the chance to explore their individual creativity within a framework of structured, supported and inclusive drama activities. Many previous Futureversity partcipants have gone on to join our Solar Youth Theatre, a specialist group for disabled teenagers. We are always looking to fund the programme through a variety of different trusts and foundations to be able to offer a one- or two-week programmes in holiday periods. If you are interested in helping us with fundraising, please contact us.